Samford University has received a $600,000 grant from Lilly Endowment Inc. to further the work of anima: the Forum for Worship and the Arts. Housed in Samford’s School of the Arts, anima is fostering vocational exploration, theological nourishment, spiritual formation and artistic aspiration among young people. “The grant from the Lilly Endowment will help us build on these already successful endeavors,” said Eric L. Mathis, director of anima and an assistant professor of music at Samford. 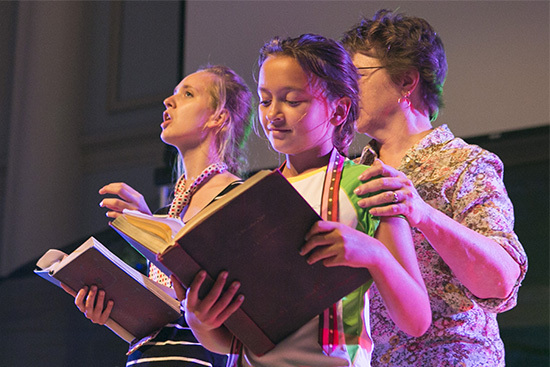 The anima initiatives and resources are designed to help young people deepen their knowledge of worship and the arts by exploring their local and global experiences of worship, and by reflecting on the history, theology and practice of worship. The grant from Lilly Endowment will support several projects during the next three years. They include expansion of a summer workshop for high school students and their mentors, and the addition of an overseas pilgrimage for high school juniors and seniors to experience and participate in worship, the arts and restorative justice practices in another culture. Also, support from the Endowment will allow anima to increase its presence on the web by creating additional worship resources for congregations. It will fund a research project to determine where worship is positively forming young people and congregational identity, and where it is not. The founding director of anima , Mathis arrived at Samford in 2010. He holds a bachelor of music from Wheaton College, a master of music and master of divinity from Baylor University and George W. Truett Theological Seminary and a Ph.D. in theology from Fuller Theological Seminary. To learn more about or to make a donation to anima , visit www.animatheforum.com.